Just two miles south of Delaware Ohio on route 23 a small sign on the East side of the road announces the observatory. An equally small road begins to ascend the hillside as yet another sign warns to beware of golfers. The beautiful grass gives way to dense woods as the road continues upwards. Moments later you will find yourself on a hilltop clearing with the observatory beautifully framed amongst the old trees. Named for Hiram Mills Perkins a Professor of Mathematics and Astronomy with the Ohio Wesleyan University. Mr. Perkins made a small fortune during the American Civil War selling pork to the Union Army. He lived a modest life and towards the end wanted to give back to both the university and Ohio. Plans began to emerge and to his surprise he would not only be able to build a observatory, but it would be one of world class status. Hiram Perkins gave $200,000.00 to the University “to build an observatory of the first magnitude.” Ground breaking took place May 23, 1923 and Professor Perkins was able to turn the first shovel. Unfortunately the Professor died the next year and was unable to see the completed project..
Perkins Observatory began operation January of 1925 and with the installation of a 69 inch mirror it became the third ranked observatory in the world. Over the years technology and the world have passed Perkins Observatory and city lights have encroached on all sides yet it still offers the public a beautiful and intriguing view of the nightly heavens. 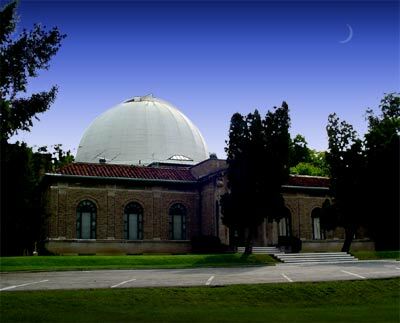 Perkins Observatory presents diverse year round public programs. Depending upon sky conditions some evening may include planetarium shows. All guests need to acquire a ticket before admission which can be purchased by calling 740-363-1257 The observatory can hold 90 people and will be operational during most weather conditions. Due to the ever changing time of the setting sun starting times will change accordingly. Latecomers will be denied entry so please call ahead and be on time. The location of Perkins Observatory can also be found 10 miles north of the junction of US 23 and I-270 in Columbus.